Carlos, if that item on eBay is plastic, then it could work if you cut the top off a bit. 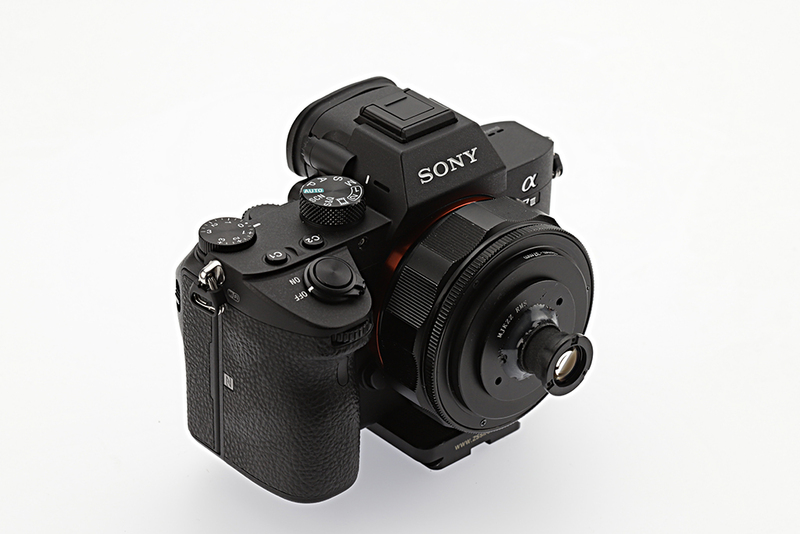 What I am concerned is that the large opening (where it is connected to a speedlite) seems to be too small, you will get stray lights entering lens, causing hazy images, even with lens hood (self made one with black paper). But from the weight (303 grams), it might be made of glass, in that case, it is hard to cut them if cuttable. My final version has about 13.5cm opening in the back and about 5cm in the front (where camera is at). It works well for lenses with working distance less than 10CM but greater than 1cm and is thin so it can be partially inside the globe. For lenses with longer working distance, I think I need larger globe, otherwise, the lens will be outside the globe and reflection of the globe can cause haze. It seems to be easy to find other alternatives of different sizes and made of acrylic or polycarbonate, as we can see in eBay item number 282445175786 or as we can see in the image of the 263329203405. These solutions need to be worked to have some utility as a diffuser as you describe, but, however, I still can not figure out exactly how to hold the globe for horizontal use. What solution did you use to fix the globe? Hi Carlos. Here's a quick phone snap of how I hold my diffuser for a horizontal rig. Many thanks for the efficient suggestion. Hi Carlos, I use a piece of flat board (actually it is a piece of aluminum) and put a layer of hot glue (about 2mm thick) and put the globe on that. The globe is very light, about 50 grams, so it works very well. Underneath it is a so called lab raiser to adjust its height. Beatsy's solution is cool, too, so you can drill a small hole on the globe and attach the globe to it. Another solution is to use a relatively large but short tube, like a segment of extension tube and just put the globe on it. Oh, by the way, after putting a long lens hood made of black paper, I am able to use the ProOptics lens that has LONG working distance. So your eBay items might work even though they are 150mm in diameter. Please see my newer post, it actually works better in terms of solid black background. Every time I visit this thread, I am struck -- and puzzled -- by the absence of "black hole" on either of the two images of the jewel beetle. When I say "black hole", I mean the reflection of the lens aperture that is very difficult to avoid when shooting a mirror-like surface. In your other thread, the black hole makes its usual appearance as dark blobs in the middle of the prothorax and the elytra. I have no trouble understanding that one. But in this thread, neither surface of the jewel beetle shows any significant black hole that I can find. This is so very puzzling, if you posted the images with no comment except to say "This beetle is shiny. How was it illuminated? ", I would not be able to think of a good answer. Simply using a wrap-around diffuser, no matter how good the diffusion is, does not explain the absence of black hole. Did you manage to orient this beast so that no significant part of its shell is parallel to the camera? Or is the color actually a matte surface, lying underneath a shiny clear coat? Or something else?? The lens used for these two is very small, outer diameter of the lens is 20.5mm and is hooded with black paper wrapped around it. It has LONG working distance, about 80mm, the opening of the globe where the lens is looking through is only 45mm. The only "trick" I did was to intentionally keep the lens right at the edge of the globe. So if you look at the picture, you have a large globe (150mm) and a small lens at the edge of the globe . . . lights can hit the subject without being blocked too much. 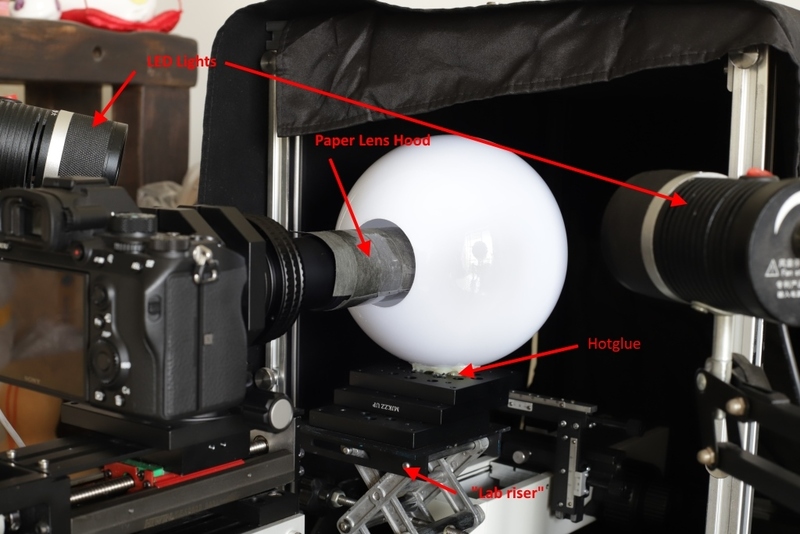 So these two images do not have "black hole"
The lens used in "other thread" is that ProOptics, with outer diameter of 42mm , the diameter of glass is about 25mm, and the globe used in that setup has 53mm hole for the lens. The lens is also hooded by paper hood and it is extended into the globe, again just a bit. Even though the working distance is longer, the larger diameter of the lens (or appearance of it) and the larger hole for the lens block/reduce some light, thus creating "black hole" effect. Other than the "trick" -- letting the lens at the edge of globe, there is NO special treatment at all, nor heavy post trick, I only did contrast adjustment, just "plug and play", so to speak. 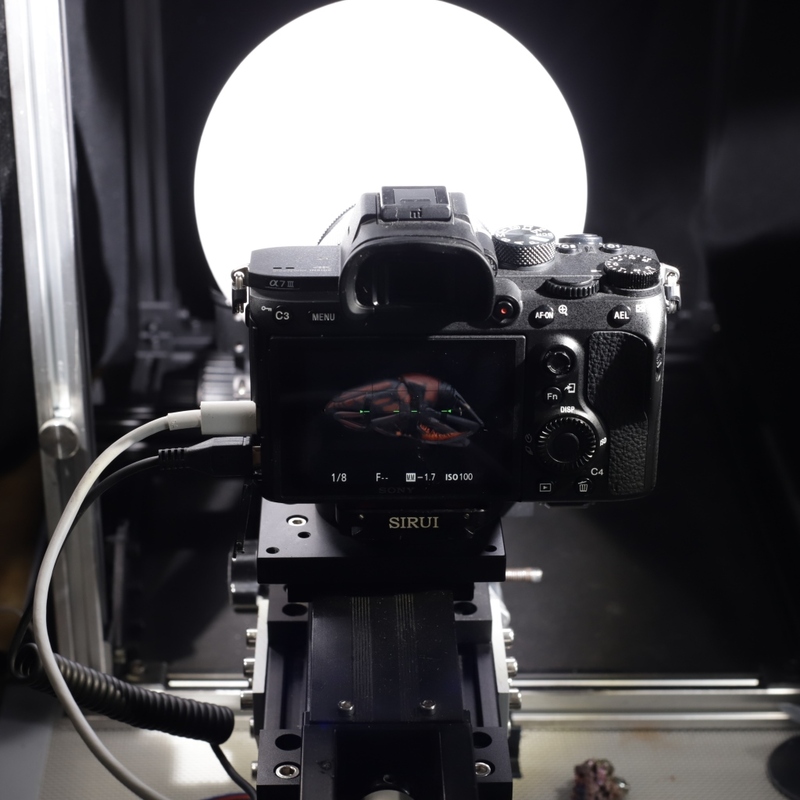 Here is the setup for the "other thread", it was shot as demo purpose, when I shot the other beetle, the hood was just barely at the edge of the globe. Lens used for these two images, the lens is very small and is "far" away from the subject and is at the edge of the globe. I think for a "wrap-around" diffuser, if it is a tube like one like a lot people use, it will have "black hole" effect because little light come from the front and if you have large lens and relatively short WD, then you end up with "black hole". I tried with that tube like setup, heavily diffused, I get "black hole" effect. Then I tried putting diffusing material in front of it and create a hole so lens can see through, I still get some "black hole" effect if I try to balance the exposure -- there is "weirdness", though subtle, so I have to adjust light outputs. Maybe later when I get the high CRI LED strip, I will try the tube like setup again for stack and stitch. Furthermore, I think if I cut even smaller hole on the globe for the smaller lens, I probably will get even better results -- there is a hint of specular reflection between the two black spots of the green beetle. FWIW, here are all the images Sure, I did remove the lower left corner (it was the gator clip) and streaks in post, but other than that, I think I only adjusted contrast and some sharpening. The lens used for these two is very small, outer diameter of the lens is 20.5mm and is hooded with black paper wrapped around it. It has LONG working distance, about 80mm, the opening of the globe where the lens is looking through is only 45mm. Now, put yourself at the location of the subject. The hole in the diffuser is 45 mm wide, and it is located only 80 mm away. Working the trig, that hole subtends an arc that is 2*(atan((45/2)/80)) = 30 degrees wide. I agree that "small lens, far away" tends to reduce the size of the black hole. 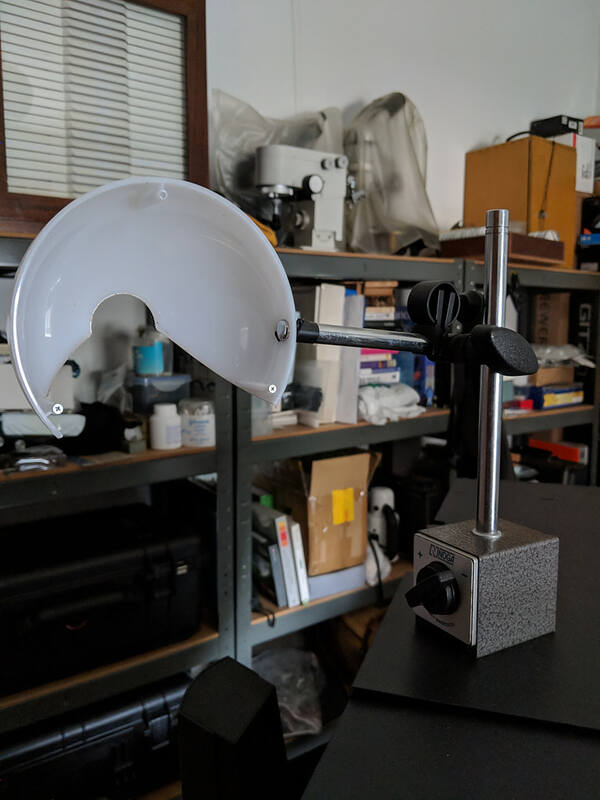 In product photography, there is a standard trick of placing the camera behind a white card, with a hole in the card that is just barely big enough for the stopped-down lens to look through. This works great for larger items, where the entrance cone can be quite narrow. If I'm using a 50 mm lens at f/11, photographing an object at 2 feet, then the "black hole" can be as small as 1 degree or less. But for macro the technique runs into an unavoidable problem that the black hole has to be at least as wide as the entrance cone, and the entrance cone has to be pretty wide to avoid diffraction. 30 degrees of black hole in the illumination strikes me as much too large to be the sole explanation of what we see in the jewel beetle images. But sometimes my intuitions are wrong. 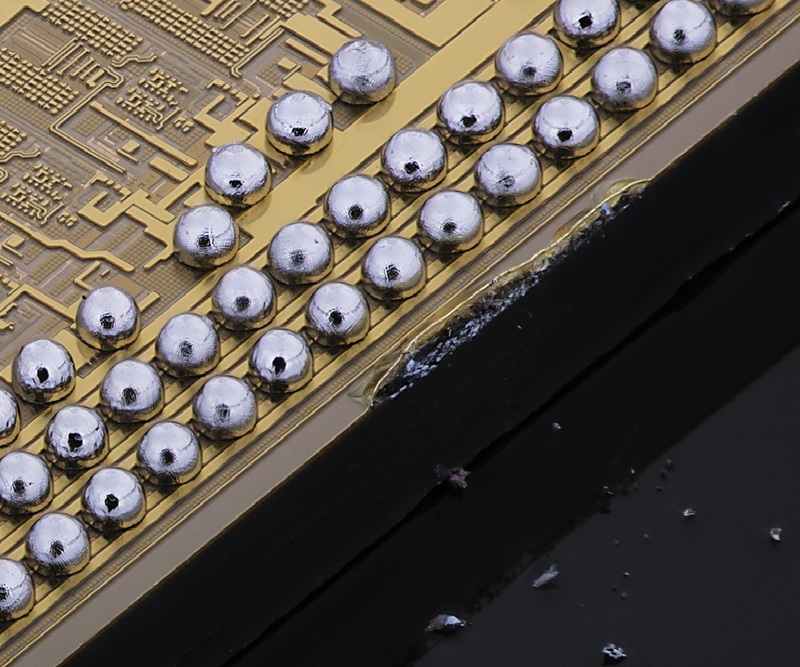 As a technical matter, it would be interesting to see an image of a metallic mirror, like a ball bearing, that is roughly the same size as the beetle, photographed with this same setup. OK, I might have sounded like "there is NO black hole" with this light setup. Yes there is, but I think for "average" subject, it might not be very visible. The is what I got using aluminum foil pressed onto a similar "broken" beetle and this is what I got after stacking 61 images and 41 images. The second one is to illustrate how "black" the background is -- it should be as I under exposed it by at least one stop so that the "black hole" is not blown and hard to see. The following one was stacked from 57 images. 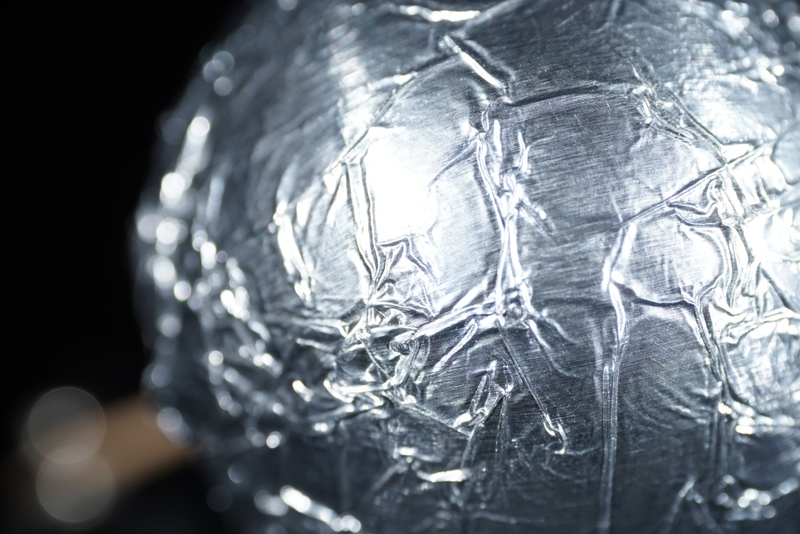 It is a ping pong ball wrapped in aluminum foil. I intentionally put the center of ball off center of image to illustrate that black hole can occur off optical axis if the curvature of the subject affords so. I believe the yellow circle "covers" black hole, judging the ratio of r and R, the angle a is about 15 degrees. If the diameter of ping-pong ball is 40mm, the "depth" of the yellow circle on the ping-pong ball should be 40 * (1 - cos(30/2)) = 1.363mm. So at 0.1mm step size, it is about 14 images. Anyways, the stack is under exposed by at least one stop, if exposed normally for a "normal" subject, that black hole might not be very visible, giving the impression of no "black hole" as shown by above two images. Yes, or you could just take the eye of a jumping spider and in both cases you would probably get a picture with a well defined black hole. I think it could be usefull to remember that a perfect mirror must have two relatively independant properties: it must be glossy (a opposed to matte) and it must be smoth (as opposed to rough). A polished metal sphere or a spider eye are both. 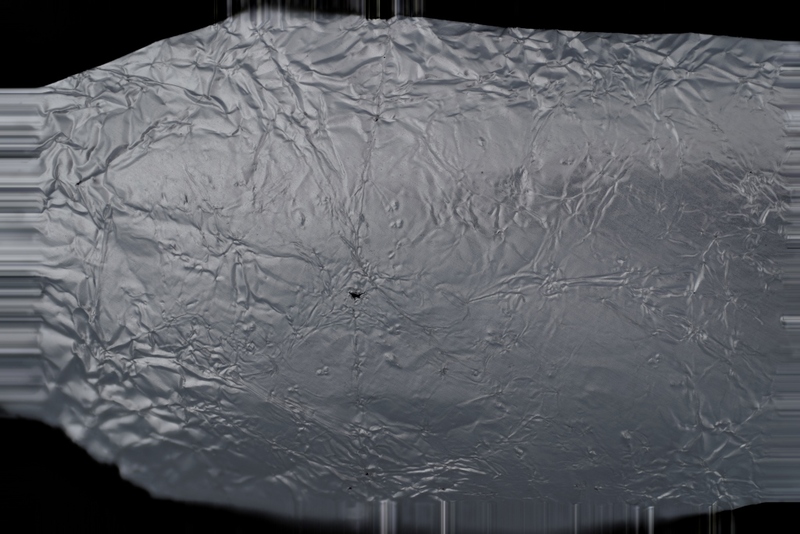 But a pingpong ball wrapped in metal folio is not smooth, only glossy, because of all the wrinkles on the surface. As a whole it is reflective, but it lacks the other property of a perfect (spherical) mirror, the smoothness or surface flatness. Because of that it is unable to create a precise reflection or create a mirror picture of the black hole in the diffusor. It is only able to create a blurred, diffuse reflection. Like a heavyly scratched lens which let most of the light pass through, but disturbs the directions of the single rays. That could be an indication of the properties of the beetle shield. A closer examination would undoubtly reveal a pattern of roughness on a smaller scale invisible on the photo. I wrote "relatively independant properties" because it is obious that if the roughness of a reflective surface reaches a certain intensity level and sufficient small dimensions it will make the surface practically unreflective. Edit to add: If you take a look at the picture of the foil covered pingpong ball just above this post you will notice that if you focus on the flat parts of the folio (those areas parallell to the surface) the darkest of theese all lay in the middle of the yellow circle. 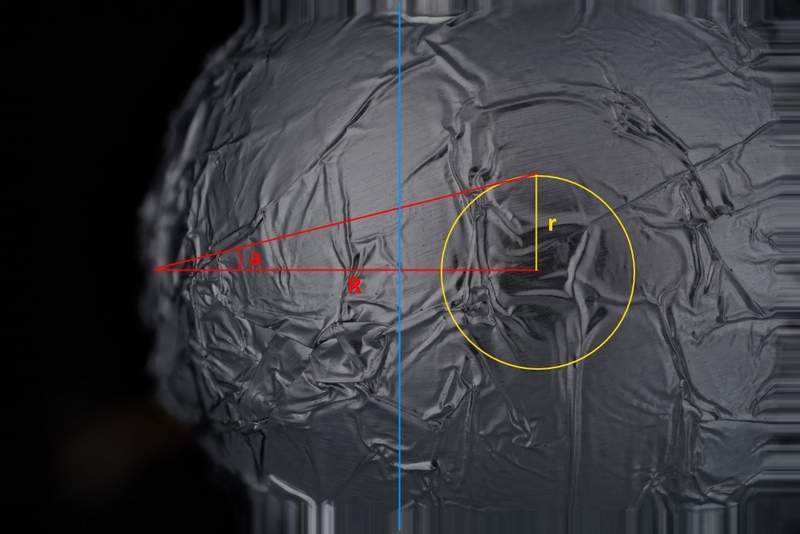 If al parts of the folio were pressed hard to the surface of the ball the image of the black hole would be much more distinctive. Here's an example (crop) of a small (~100 micron) spherical mirror-like surface where you can clearly see the lens effect. 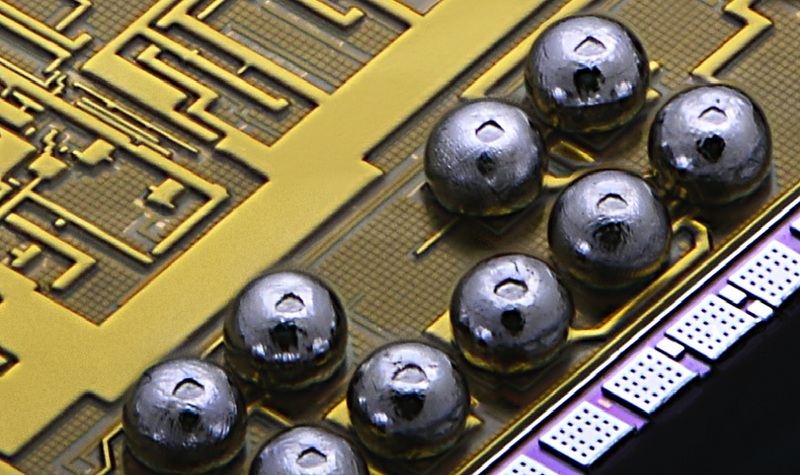 This is from a chip image with a double-plus diffused light sources (~6 I believe). Nice setups with the plastic domes, I just ordered the Godox AD200 dome to give it a try. The foam cups I use work well, but eat lots of light...too much so for continuous lighting IMO. 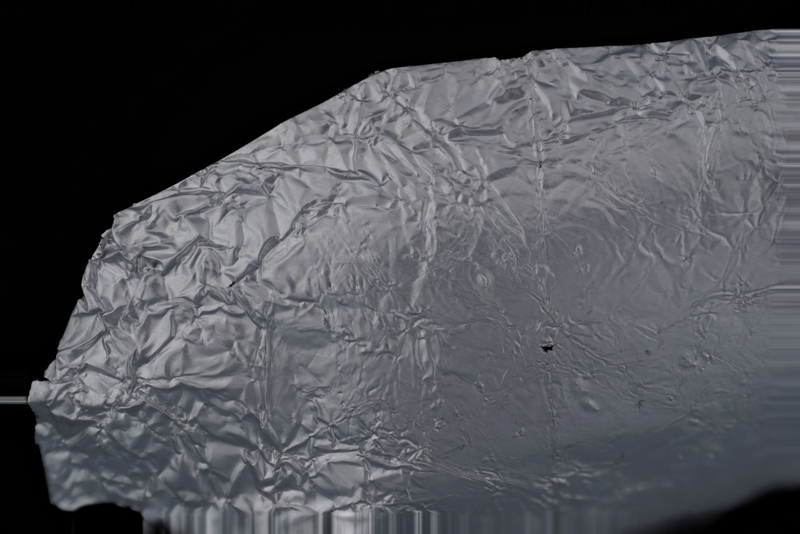 The aluminum foil tests are interesting, but I find myself wondering how shiny the material actually is. The aluminum foil in my kitchen has one side more dull and one side more shiny, but neither side really mirror-like. The images here remind me a lot of the dull side, but of course we're discussing a lighting arrangement that has made an apparently shiny beetle look matte. Too many variables. True, and this reminds me that 30 degrees is just a hair more than the entrance cone of an NA 0.25 objective. We know from many experiences with spider and insect eyes that this is quite visible in mirror-like surfaces. However, there is another factor that may be in play with the beetle. The reflection from a spherical mirror appears to be located at a depth that is halfway from the surface of the sphere to its center. With most spider and insect eyes, that depth is contained within the stack, so normal processing renders the reflection as a sharply focused black hole. We know that careful processing that avoids the focused black holes can give an apparently matte appearance to even very shiny surfaces. See for example the "Surface of dragonfly eye" at http://www.photomacrography.net/forum/viewtopic.php?t=11271 . It occurs to me that the back of this beetle might be curved little enough that the reflection is significantly behind the back of the stack. In that case the black hole would never be seen focused. The overall situation would then end up a lot like the dragonfly eye, but without all the manual labor to get there. An interesting problem. Lots of factors involved. OK, first of all, let me correct the formula for "depth" of yellow circle, it should be 20*(1-cos(15)), not 40, so the depth is 0.681mm or about 7 images for 0.1mm step size. 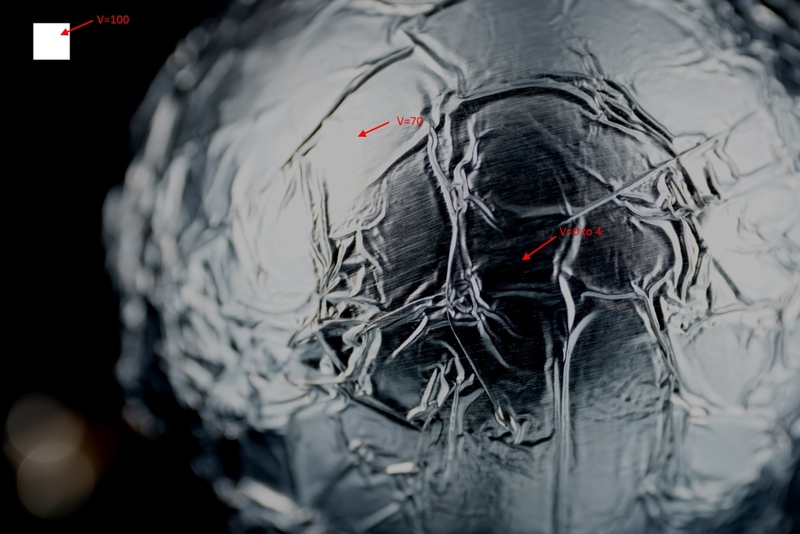 Rik, yes, I intentionally used the "dull" side of the foil and I actually squeezed it into a ball and spreaded it out again to "simulate" the surface of that beetle. Nontheless, I did try to smooth the "black hole" region so it will be more refective. I think Troels has a point that if the surface is really smooth and really reflective, such as a steel ball for bearings, it is inevitable to have a black hole, which actually a reflected image of the opening and the barrel of the lens. Yes, there are a lot of variables involved, and I think the best way to model it is to do experiments, let the "analog computer" does it job. I am vacationing next week till mid Oct, so when I come back, I might do more setups, compare them and report back. This one was shot without any diffusion, so it is rather "shiny". This one was done with tube like diffusion, as you can see the black hole is bigger and more "black". If you look at the three places (first one is pure white square I drew) in HSV color space, the exposure ratio is rather high log(70/(avg(0-4)) = log(35) / log(2) or about 5 stops.